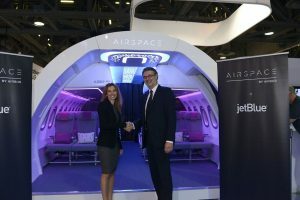 JetBlue will become the first airline to introduce Airspace by Airbus on the A320 Family, following an agreement unveiled at APEX Expo. JetBlue customers will experience this newest A320 Family cabin aboard JetBlue aircraft starting in late 2020. The longstanding partnership between Airbus and JetBlue began in 1999 when JetBlue was launched and took delivery of its first A320. Two years later the airline placed an order for 48 Airbus planes. Following years of extraordinary growth, JetBlue now operates a fleet of 176 A320 and A321 aircraft and has another 102 on order from Airbus. Highlights of the new Airspace cabin in the A320 Family include: a unique welcome experience. In particular, a customizable welcome effect is extended throughout the cabin by a central lighting strip which is visible even with open bin doors during boarding. The A320 Family cabin with Airspace features the industry’s largest overhead bins, whose conformal exterior profile facilitates smooth boarding. Throughout the cabin passengers will appreciate the increased interior width, the soothing ambience of the latest full-colour LED lighting, and a contemporary lavatory design with new comfort features.